The Priestesses of the Stygian are the conduits of their Dark Goddess and direct the lives of their entire horde to her service. Having an intimate knowledge of the Tablets of Fate and bearing its promise on their Scion Stones, Priestesses are certain of their actions and control their hordes with ruthless and pitiless ease. 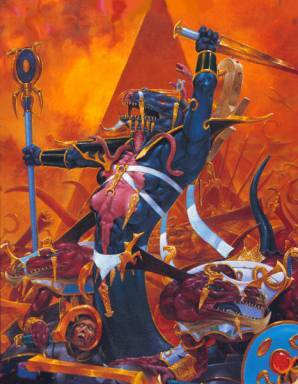 Being condemned to the legions of the Starved punishes Stygians that are born deformed or fail in their chosen tasks. There is no discussion or appeal. Much like an ant colony, the majority of the Stygian horde strives only to please their Priestess and expand their territory. While a formidable creature, the Priestess possesses powerful magic that she uses to serve her Goddess and slay her foes. Her arsenal of magic is amplified by her Scion Stone that is attuned to her person through long and complex rituals. Should she ever meet her demise, her Scion Stone will crumble away to dust, taking its secrets to the grave with her. Of their rituals only one thing is known, a Priestess draws immense power from the spilling of blood. Their altars are indelibly stained with the life’s blood of their victims; bones too numerous to count litter their vestibules and become used in their building. Records garnered from the Firstborn tell tales of Priestesses sacrificing thousands of living slaves to curry their Goddess’s favor and empower their Scion Stones. Frequently surrounded by Drugged slaves and Guardians, a Priestess is difficult to engage in hand to hand combat. Ringed with ornate regalia that crawl with living serpents, the Priestess is an easy target to spot in the seeming chaos of a horde attack. Unlike the leaders of other armies that direct their men from the safety of a remote location, a Priestess moves along with her warriors, confident that she is both safe and invulnerable to the weapons of the lesser races.